The following post was shared with the CopBlock Network anonymously, via the CopBlock.org Submissions Page. The person submitting this describes an experience they had while traveling in New Jersey to attend a work related meeting. 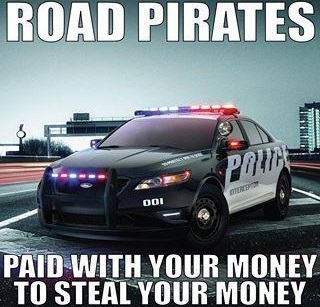 Instead of being allowed to complete a productive day of work, they were stopped and extorted by a Road Pirate intent on generating revenue for the state. They also discuss the negative impact and helpless feelings that an average citizen may often feel after being victimized by these Roadside Buccaneers. In addition, they speculate that it was a concerted effort by these New Jersey State Highwaymen to rob and plunder travelers who are from out of state or who otherwise are perceived as an easy target for Revenue Generation. I was pulled over at 6:40am on my way to an out-of-state work meeting for “driving faster” than the officer was. Prior to being pulled over, I was in the express lane on the New Jersey Turnpike and the officer was in the local lane, which is separated with a divider. Initially, I was driving in the middle lane and switched to the left lane to pass a car, before moving back to the center lane. I am an out-of-state licensed driver and was in a brand new car with New York plates (a rental car provided by work for this one meeting) and may have been perceived as a good potential revenue target. It appears a new tactic for New Jersey Troopers is to follow from different lanes, but I saw him a mile back and was driving at the posted speed limit. As background, there are a lot of cars on the highway at this hour. Along the whole Turnpike, from Newark all the way thru Philadelphia, you could see the entire New Jersey State Police was out in full force ticketing people – I personally saw at least 25 pull-overs from troopers before and after my own ticket. My ticket is not for a speeding ticket – it is for careless driving – because there is no real record of how fast I was going. I am writing this post because I feel powerless. The system is stacked against you and from what information I can find online and anecdotally, it seems there is no real way to fight this, it is a pure revenue generator for the state. My options are to pay the fine, but in doing so I am admitting guilt for “careless driving,” which in principle I find to be a hard pill to swallow, or to go to court to plead to a lower misdemeanor of “unsafe driving.” This carries zero points, but has a higher fine associated with it, which is also untrue, unless I pay for an attorney who may have connections or insight to get this ticket thrown out. Incidentally, within two days of the ticket, I received ten spam letters from New Jersey traffic attorneys in my home state. This seems appalling to me, as well. There is no potential positive outcome for me, nor any potential avenue for vindication or justice. I know this is not a major offense or grievance compared to what others may have seen. However, as a law-abiding citizen who has a great respect for our country and the law, this experience has been jarring given the sense of helplessness it has created. Those troopers are supposed to protect our roads, but instead are incentivized to make taxpaying drivers into additional revenue generators for the state and THERE IS NOTHING ANYONE CAN DO to fix the system. – Thank you to the CopBlock Network for providing a means to share this experience.